Winter is here and so are colder temperatures. While the Bedford area sports warmer winter weather than some areas of the country, temperatures still average in the 30’s and 40’s — and this can wreak havoc on your sprinkler system. Take care of your pipes and sprinklers now and avoid the high cost of repairs when spring arrives. Getting your pipes and sprinklers ready for winter is one maintenance project you don’t want to put off. Once freezing temperatures (or wind chills) arrive, it may be too late to ward off costly damage to your entire system. Just one day of freezing weather can leave your entire irrigation system at risk. 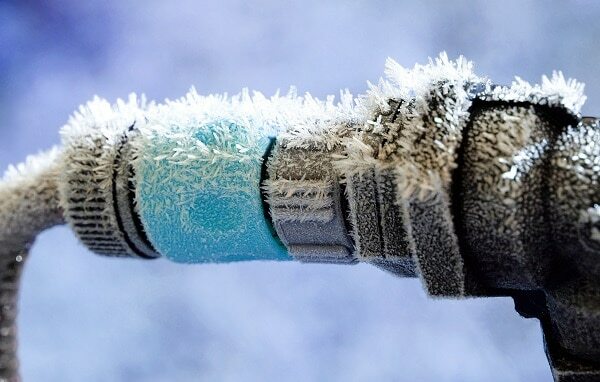 Even the smallest amount of water left in your pipes or valves can freeze and cause problems. The most common ways to drain the water from your system is using the automatic drain valve, manual drain valve or a compressed air blow out methods. If you have experience with these methods, they can be done on your own; but for most homeowners it is best to call in an expert sprinkler professional to handle this kind of maintenance. Installing proper insulation is essential to weatherproofing your entire sprinkler system. One of the best ways you can insulate those pipes is to bury them below the freeze line. Exposed pipes and valves should be wrapped with insulation and warming tape designed just for this kind of piping job. Packing them with pine straw also works well to keep pipes from sustaining damage during the colder winter months. Pipes aren’t the only irrigation system items to keep warm. Be sure to insulate backflow preventers and valves too! Be sure to shut down your controller to keep the pump from turning on automatically (this will make it overheat and become damaged). By unplugging the wires between the controls, you will ensure that your system is completely disabled. Winter plumbing maintenance is essential to keeping your sprinklers running well. But not every homeowner has the knowledge (or the tools) to do the job themselves. Instead of tackling this extra maintenance project, bring in the professional sprinkler experts from HEB Plumbing to handle all of your fall and winter maintenance. Ready to prepare your system for the winter, our maintenance service is guaranteed to protect your pipes and sprinklers all winter long. Call today to find out more about the general maintenance and repair services offered at HEB Plumbing.